One of the themes that arose from our two week trek through Maine and New Brunswick, Canada, was finding great food in unexpected places. It can simply be finding a good spot to eat in a remote place or something other than excellent seafood along the coast of Maine. It can also be from having no idea what to expect in New Brunswick. That is part of the fun. Our family trips to Maine have always been along the coast, with good reason. Maine's coastline is one of the most beautiful in the world. When you think of Maine you think of lobstermen, Winslow Homer's paintings of the sea battering Prouts Neck, Bar Harbor and Mt Desert Island. But the interior of Maine is massive, dotted with lakes and forests. Smack dab in the middle of the state, and hour plus north of Bangor, is Baxter State Park. The park is over 200,000 acres in size and home to Mt Katahdin, the state's highest peak. Less than 100,000 people visit it each year. With two weeks at our disposal Karen decided it was time to venture inland and visit the park. She found a great place called Big Moose Inn with cabins on Lake Millinocket and a short drive to Baxter State Park. The Inn's restaurant, Fredericka's, was closed during the week when we were there so we ate at the Loose Moose Bar & Grille (why the e in grille? ), their casual spot that was open all week. I was particular to the Thanksgiving hero and they had a really good beer selection. But that was not the surprise. 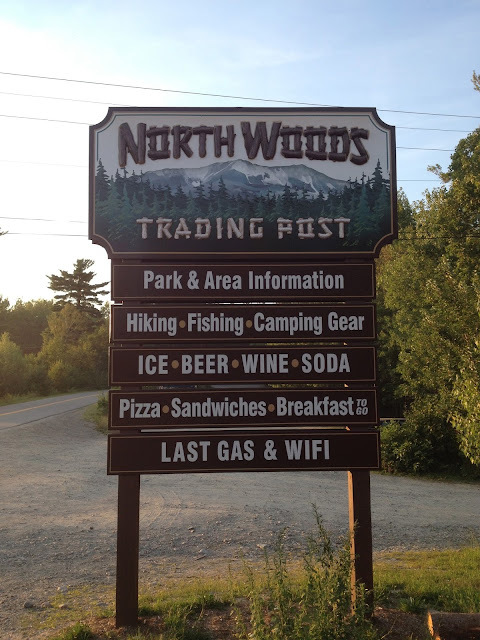 Next to Big Moose Inn sits the North Woods Trading Post. It is the last place for food, drinks and gas before you head into the park. It stocks all the basics you would need for camping (food, drinks, knives, matches, maps, fishing gear, etc) as well as souvenirs. Most people come for a week and stock up at the supermarkets in Millinocket. The cabins have full kitchens so you can make all your meals there. People use the Trading Post to fill in staples they forgot or ran out of. We were only there for two days so we didn't shop before hand. We lived in that place. Chicken salad with blue cheese and grapes on fantastic, thick cut, house made wheat. Sweet, savory and absolutely delicious. The blue cheese was sharp and creamy and balanced perfectly with the sweet grapes. The bread was a beauty. No joke, this is one of the best sandwiches I have ever had. Was it because I did not expect to get anything like this at the Trading Post? Maybe. Was it because I ate it on a picnic bench looking at a lake? Maybe. But I am pretty sure that if I had gotten it at a gourmet deli in NYC and eaten on the M23 bus it still would have been great. I would return to Baxter State Park for the hiking, the beauty, the nature and how devoid it is of other people. I encourage you to go as well. And if you can get a world class sandwich to boot? Icing on the cake. Love it. The sandwiche (see what I did there? ), the view, the green green trees. Fantasticke. Hello, Here is a hub of Mahjong Connect for free online games. These games are of tiles games and also these games are used to check your speed and matching skills. These games are best for both health and mind. You should try for once. Hey! Thank you for sharing. But as i think sandwich is not a great food only for unexpected places. It is great just about everything. Great for office food, great for small lunch. We here at best college essays service just love eating sandwiches. They help us in writing great academic papers! In Canada, not only many beautiful places. But also a lot of tasty food. I remember my trip to Vancouver by car. How I traveled with my friend hundreds of miles and enjoyed the beautiful nature and delicious food in the roadside cafes.